From the bottom of the approach road ramp at Temple Meads station, cross Temple Gate and turn right. About 50 metres further along, turn left into Redcliff Mead Lane. 65. 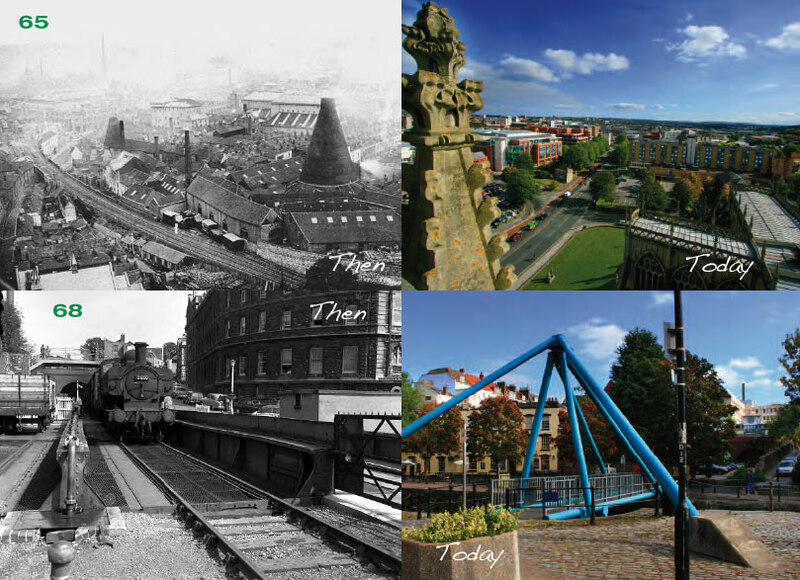 When the Great Western Railway finally agreed to build a goods line into the Harbour, the route they chose started from the Temple Meads goods yard and ran parallel to Brunel’s station building, crossing the road on a bridge behind the George & Railway pub and heading towards St Mary’s, Redcliffe church. Ascend the slope. As you pass Somerset Street, the road becomes Prewett Street. 66. On the right here is the base of Bristol’s last glass cone, now a hotel restaurant. Glass made in Bristol was world-famous and the city had many of these tall, distinctive structures. Nearly all had closed before 1825, and this one spent the majority of its life as home to H & T Proctor’s artificial manure works. It was truncated in the 1930s when the upper structure became dangerous. Continue to a footpath on the right just before Redcliffe Methodist church. Follow this to the junction with Pump Lane. 67. Below the railings here can be seen the eastern mouth of the railway tunnel underneath St Mary’s churchyard. The tunnel broke through the middle of Redcliffe caves. Turn left into Colston Parade and continue to Redcliffe Hill. Turn left and proceed to the pedestrian crossing. Cross here or use the underpass. On the opposite side, turn left and then right into Guinea Street. Pass the entrance to the General Hospital and at the bottom of the hill turn right towards the Ostrich pub. 68. On your right as you approach the Ostrich you’ll see the mouth of the tunnel exit. The railway crossed Bathurst lock on a steam-powered bascule (lifting) bridge on the site of the present footbridge, before continuing to Princes Wharf. You can almost follow its path by heading through the archway ahead of you and straight through the housing development. You will emerge on Wapping Road, where you turn right and you’re back at Prince Street Bridge.